Today, I have two holographic nail polishes by Glitter Gal. They are from their latest collection. 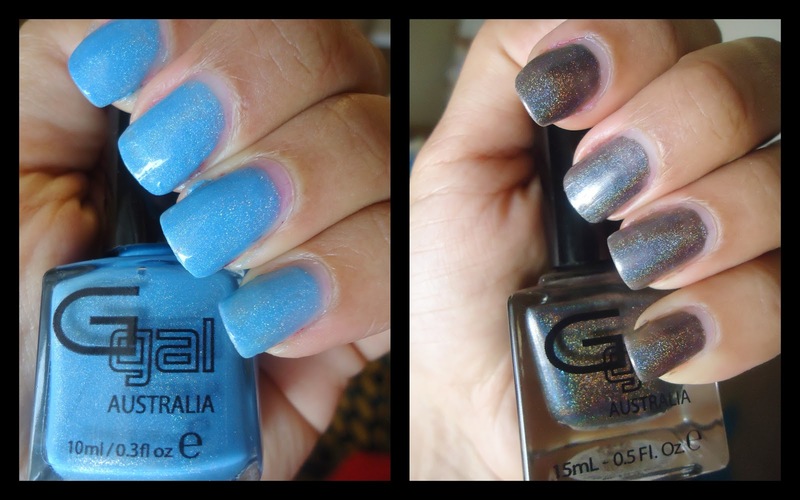 The two shades that I have are totally different from each other and its interesting to see how the holo effect differs between the two shades. Glitter Gal has a pretty interesting background and I was quite inspired to know how two, long time friends, Kerry and Anna partnered together to create Glitter Gal Australia. With Kerry's experience as a makeup artist and Anna’s background in creating/supplying “private label” products to other Australian companies, together they designed “Glitter Gal Australia” a great makeup and nail polish range. Products by Glitter Gal Australia are safe, truly unique and premium. Blue Suede Shoes is a denser shade with a suede/holo effect and comes in a 10ml bottle. This bright blue shade has a less pronounced holo effect and appears more like a cream finish nail polish but in the sun it looks totally amazing. I feel this shade really lights up my hands. Its a beautiful sparkling color. I am wearing two coats of this polish. This is such a gorgeous charcoal holo polish! I am totally in love with it. The holographic effect is so beautiful and shows up nicely at two coats. The formula is really good as it dries fast and goes opaque in two coats with no bald spots! This one comes in a 15ml bottle. 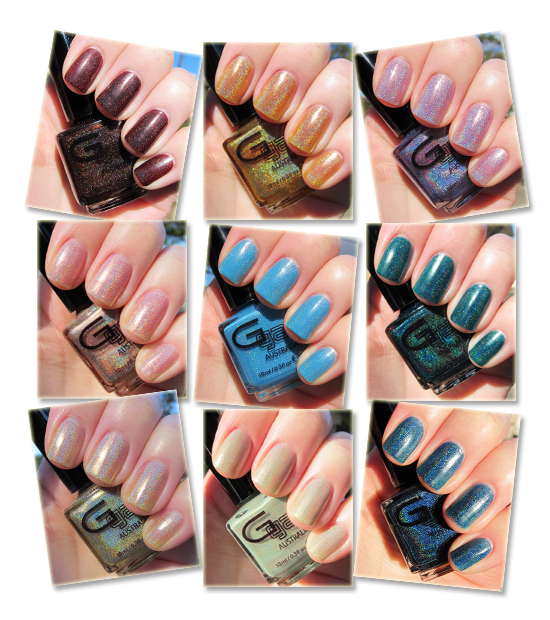 You may also follow Glitter Gal on Facebook and Twitter to catch up with the latest releases. wow, all the shades are stunning on you!